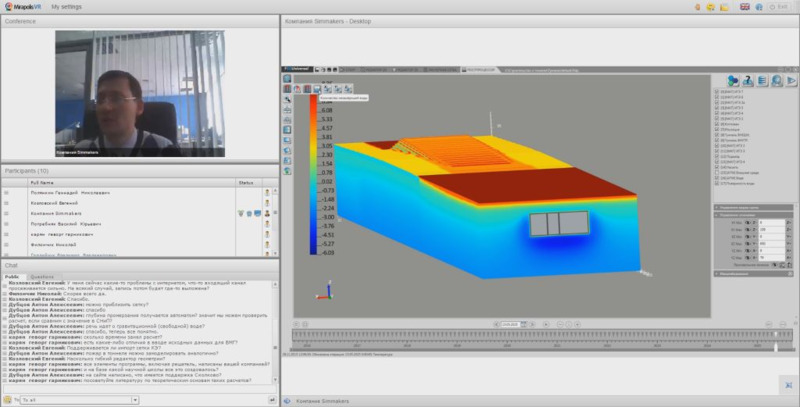 Within training courses and guidance “Introduction to Frost 3D Universal Basics” Simmakers Ltd. conducting webinars devoted to computer simulation of temperature range of permafrost. 1) Design of tunnels, mines, dams, and roads on permafrost. 2) Design of above/under ground pipelines, transmission towers and production wells in the permafrost areas. 3) Thermostabilized tank basement, buildings, constructions with vented crawl space, and pile foundations. 4) Interaction between group of buildings and related infrastructure. Also it is possible to customize webinar program, in order to align with your team and organizational goals. The first webinar was held on November 28, 2015 for the community of Geotechnical Engineering, Tunnels and Underground. For recorded webinars please visit our YouTube channel. 3. Telephone number and e-mail address. Moreover, in advance, it is possible to ask our technical experts some questions you would like to hear during the web conference. You are welcome to join our webinars!